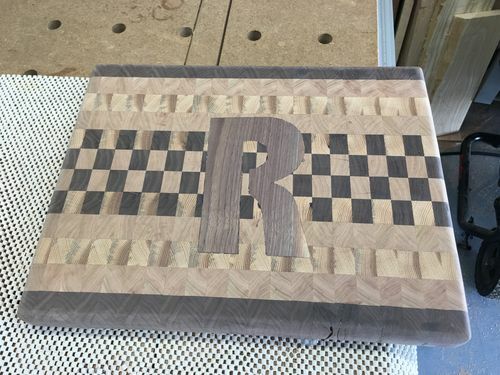 This is my second attempt at an end grain cutting board. Learned allot from my last one and the comments on that thread. 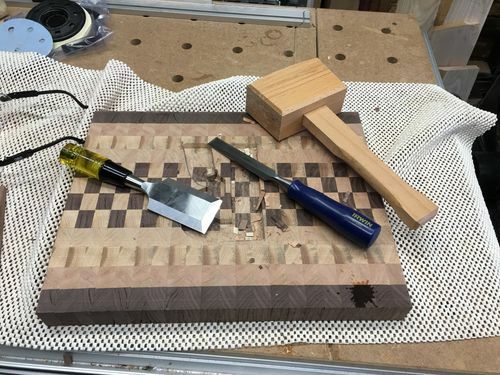 I sort of through caution to the wind, after the final glue up, and a quick low grit sand, I chamfered the leading and back edges with a block plane and put in the planer, a Dewalt DW735. Took light passes with zero tear out. Got it nice and flat. Used a Rotex 5” for the initial flattening and sanding until I got to 150 grit then switch to a 6” finish sander. Worked much better than my 4×24 belt sander. I wanted to try something new, so I attempted a free hand Inlay. Used a my plunge router and frankly it was not that clean, and there were extensive gaps. Foolishly I tried plain glue (instead of a sawdust mix) and it just soaked in. Then I went to epoxy, another failure as the one I used was too viscous to fill the gaps, by that point I was just fed up, and anyway the Bandsaw cut inlayed R was not that great anyway I just sanded and finished. Ordered an MLIS Inlay set, next time I hope to have better success. Rounded over the edges on the router table and sander up to 220. Fished with General Finishes Salad Bowl Finish. I really like this Finish so far, and I’m planning on using it going forward. I’m not that happy with how this one came out, but I doubt who I’m giving it to will notice. Wood is Walnut, Cherry and Hickory BTW. Here is a before Finish pic and I used some chisels to fine tune the hole(mortise?) for the Inlay. This is a beautiful cutting board and I love the pattern. I like your choice of woods, good workmanship!